Pedestrians often stop in front of Frank Mauceri’s home and office on Chicago’s North Side, mouths ajar and eyes raised to the sky. He understands the impulse, as he too is often mesmerized by the dual, 10-foot sails silently spinning on his rooftop. These elegant objects are actually a new class of vertical-axis windmill. They are able to produce electricity in the variable winds of urban environments, unlike the traditional turbines used at large wind farms. By using the twisted-ribbon shape of a helix, these generators overcome the barriers that have impeded the adaptation of other windmill types to small-scale home use, such as noise, impact and price. Though a few different designs are being tested, helical turbines all basically work the same way. A helix-shaped blade constructed of a flexible yet rigid material is mounted vertically to a rotor. The helix’s shape allows the turbine to catch wind from many more directions than a horizontal turbine and funnel that wind into a circular motion. This harvested energy is translated into electricity that can be used at home or sent back into the electrical grid to offset utility bills. “The design [of the current models] has been around since the early ’90s,” says Ken Morgan of Helix Wind, a new company marketing a helix turbine. Other kinds of helical turbines date back to the 1920s, but they have only recently been engineered and designed to a level that is marketable to individual consumers. Traditional wind turbines, which utilize the familiar, paddle-shaped blade, make loud whistling or humming sounds because the blades spin up to 10 times faster than the surrounding wind. The noise is loud enough that wind farms are consistently met with community opposition. Helical turbines, though, are nearly noiseless because they spin at the same speed as the wind blowing into them. Mauceri’s two Aeroturbines, designed by the Chicago company Aerotecture International, have been running atop his Chicago home since July 20, 2007. The number of birds killed by wind-farm turbines has been measured by the American Wind Energy Association to be as high as 10 birds per megawatt per year. Wallace P. Erickson, an environmental consultant with Western Ecosystems Technology Inc., published a paper in 2002 that attributed as many as 28,000 bird deaths to wind farming per year. While 28,000 may sound like a large number, it is only a small fraction – less than 0.01 percent – of the 860 million birds killed annually by buildings, power lines, cats and automobiles, according to Erickson’s paper. But for home users, the idea of any number of dead birds littering the lawn or roof is less than attractive, and bird safety was one of the big reasons for the Mauceris’ excitement over their helical turbines. Price was also an issue for the Mauceris. Aerotecture’s 510v, one of the two models Mauceri has on his roof, costs about $15,000. One turbine offered by Helix Wind, which generates 2 kilowatts of power, costs less than most people pay for a used car – about $8,000, according to Ken Morgan. Both Helix Wind and Aerotecture International expect turbine prices to go down in the future as well. With a small array of solar panels to augment them, and the ability to sell extra electricity back into the grid, the two Aeroturbines on Mauceri’s roof produce enough power to completely offset his annual electricity bill, he says. “You might be able to pay off a $3,000 to $6,000 investment in 7 1/2 to 15 years [with your energy savings],” says Daniel Brands, an environmental scientist hoping to design his own helical generator. The financial benefits of wind power depend on domestic energy consumption and the kind and quality of wind available. With this in mind, Helix Wind’s Web site includes a payback calculation to help individuals gauge how long it would take for a turbine purchase to pay for itself. But while a small turbine might be individually affordable, some experts argue that individual production is neither the cheapest nor the best way to reap the benefits of wind energy. George Douglas, a spokesman at the National Renewable Energy Laboratory in Boulder, Colo., says the lab is investing in some small-wind technologies. But overall, NREL scientists believe they can have the “largest impact” on national energy usage by continuing to improve the big turbines that generate much more power and can be grouped in high-wind locations, such as ridge lines or offshore. In its mission statement, the NREL sets the goal of increasing wind power production in the United States to 20 percent of the nation’s energy usage, a percentage that reflects the lab’s assessment of the limit of infrastructure and usable land-space. Small wind, Douglas says, does not offer the kind of efficiency that large wind does, and efficiency is the key to reaching that 20 percent goal. On the other hand, Helix Wind’s Ken Morgan says that offering the option of energy independence is worthwhile regardless of what is happening with big wind. Helix Wind is dedicated to providing and enhancing that option. 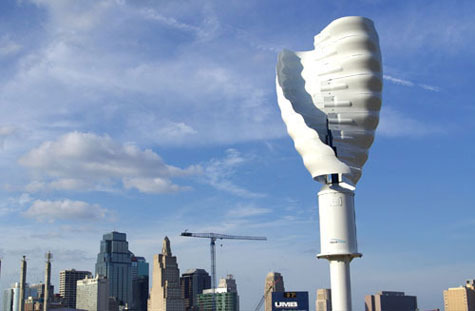 These small helical turbines make home and urban energy production possible. And even if it is not part of that national 20 percent, a turbine can be a significant part of one household’s energy signature. Mauceri stresses that though the energy savings are great, his turbine purchase involves more than just penny pinching. The effect on the environment from using clean energy is also worth something, says Mauceri. “This was always supposed to be a green project,” he adds. Plus, he feels that his family’s turbines also serve an educational role by encouraging people to think about alternative energy options. I’ve been looking at wind turbines to install at a new house but my research in wind turbines indicates the vertical turbines promise more than they deliver. Is there independent confirmation of the power curve advertised by Helix? I really want to believe the problems with vertical turbines have been solved but I need proof. If Mr. Mauceri is reading this, have you compared the real output to advertised output? I think it’s still too early to be able to tell just how well any of these technologies are going to work, because so few models have been installed. But the best thing to do, I’d say is to consult directly with manufacturers, and get an idea of how a turbine would perform in your area. Obviously everyone wants to hyper their own product, but different turbine technologies perform better or worse in different environments. With wind speed, height, consistency, and your own energy consumption all factors in efficiency, you have to look for a tailored estimate. When I talked to Mr. Mauceri, he said that with his combined solar array and turbine set, he was making enough electricity to nullify his energy bills, but I don’t know what the “advertised output” was supposed to be for a comparison. Google for link to windenergyphilly details. Let Philadelphia SW section declare the first section to achieve sustainablity within Philadelphia residential application in harnessing wind. Dec 2010 the cap removes from our electricity provider whom has already been approved for 41% rate hike. Motivated buyers live within our city. email carinknightresearcher@gmail.com for additional sales and installation solutions. im zachhhhhhhh and i think this website is bullllll.. this is all a lie…i would know more about this then you..
You could definitely see your skills in the paintings you write. The world hopes for even more passionate writers such as you who are not afraid to mention how they believe. At all times go after your heart.